On this episode of SPx, Ashley and Joe welcome Joanna Sikes to the studio. Sikes is the Executive Director of the Imagine Museum, which opened in St. Pete in January 2018. Sikes boasts a long career in art curation and deep involvement in the American Studio Glass movement. The Imagine Museum is her fourth museum endeavor. Sikes spent 30 years working with visionary glass artist Dale Chihuly and now acts as a consultant on projects of many genres. Most recently, she helped launch a marine wildlife rescue with billionaire philanthropist Paul Allen. Joanna Sikes has had an incredibly varied life and a fascinating multitude of careers. After singing for Santana, Sikes began her work with Dale Chihuly, the foremost artist in the American studio glass movement. "I was really fortunate to get hired by Dale Chihuly to basically manage his studio and build his career, and I did that for 30 years." Now, Sikes is serving as Executive Director of the Imagine Museum, one of four museums she has been a part of starting. In her role, she commutes from Seattle. "St. Pete not only does it have this wonderful cultural vibe, this aliveness about it, but also you have all these amazing museums that are all opening within a very short time period. And for a city of this size to have this caliber of cultural institutions, especially at this point, it’s building up within the arts – it’s astounding!" "The opportunity to come here and to have a chance to work with a team building a glass museum is a chance in a lifetime." "Here, it [the studio glass movement] is on fire. And it’s so embraced by this community and all of the artists are here and everyone that I work with in Seattle is here blowing glass at the various facilities." "You have this museum that has a founder who actually buys one of the most important glass collections that was curated for her by the Habatat Gallery, by Corey Hampson. When you build a museum you’re lucky if you can get a collection sometime within that third year of operation. But this museum got to start with a collection." "The city of St. Pete is amazing to me because it’s so… I don’t know, it’s active, it’s alive, it seems to be embracing things, it has opportunities for people." "I started out as a museum curator and I was a director and fine arts museums and so forth. But I really wanted to have a part to play in the arts. So pretty early on I decided that I just didn’t want to work necessarily for museums, I wanted to work for artists because I wanted to get close to that process." Sikes got involved in the American Studio Glass movement - so named because the Americans developed a furnace to heat the glass small enough to be used in the studio. American artists began using the glass in a way that had never been done before - turning the glass into sculptural objects. Now, Sikes serves as a consultant on various museums and projects: "When you decide you’re gonna be a consultant you think you’re gonna have all that free time and then of course you work twice as hard and twice as much as you did before." "You need someone to come in and turn the business aspect of it around. Because I do, obviously, love the creativity, but I also like the business of a museum." On gender: "It’s about being a girl. If we negotiate differently, we manage differently, we think differently, we have different things where we get our power from. And so just remember that. It sounds simple, but I didn’t feel that I was competing with any of the men that I worked with. I felt that I was equal because I was always myself." "Sometimes I’m not necessarily the most popular person in the museum but I would like to be the most respected one." "We have a very defined mission and that is that we are talking about and we’re showing the American Studio Glass Movement. And our founder is adamant and rightly so that we uplift, inspire and educate." "Coming to the museum, I think is really important, because it does give the visitor an incredible view into exactly what the glass world is all about and the way the Americans changed it." American Studio Glass movement: "One of the things the Americans did is they didn’t use molds. In other words, they let the glass lead." "First is it something that I’m really strongly interested in, it’s something I can learn from, it’s something that I can be totally engaged in so that I can be successful?" "Working for Chihuly I’ve got to meet every scientist I ever wanted to meet in my life, because they understood not just the chemistry and the physics of what’s going on, but it’s totally experimentation and you get immediate gratification or not when you’re working with a fluid material." "Be ready to have real conversations with people, you’ll be very surprised. Listen, listen a lot and especially at the beginning. Don’t get in your way, don’t set things that make you think that you can’t have a conversation with anybody you want to." Sikes' shout-out - Jane Buckman, the deputy director of the Imagine Museum. "she can be in the weeds of this organization with all of these new people, with all of these new challenges and she can do it. That takes an incredible talent and strength and I think that’s something that as women, when you had asked me that question, sometimes we forget we are outrageously strong." "I realized there’s an art movement here, or something that could turn into something very distinctive, very American – just the way they were using the material. And so I was really fortunate to get hired by Dale Chihuly to basically manage his studio and build his career, and I did that for 30 years." In early 2018, St. Pete’s already impressive collection of museums became even more so. The Imagine Museum opened its doors in late January, boasting one of the foremost glass collections in the country, curated by the highly-respected Habatat Gallery. The museum and its mission, “to inspire and uplift and educate,” are a vision of the museum’s founder Trish Duggan. 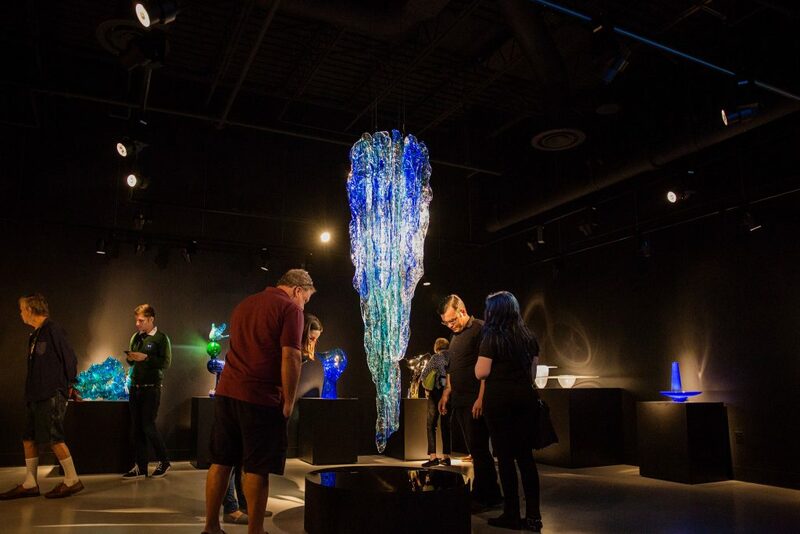 With this staple on Grand Central District, St. Pete has secured its foothold as the epicenter of a truly American art form – the Studio Glass Movement. The studio glass movement was born out of the Toledo Museum of Art, where Harvey Littleton held two studio glass workshops in 1962. He was the creator of the first glass furnace small enough, and inexpensive enough, to be used for independent artists within their own studios. Littleton later added a glass program to the ceramics program at the University of Wisconsin – Madison, where he taught. His students would eventually include Dale Chihuly, Marvin Lipofsky and Fritz Dreisbach, each of whom became seminal artists within the movement. The foremost name in the studio glass movement is Chihuly, whose infamous and colorful glass installations are displayed the world over. St. Petersburg is home to one of his most famous collections – displayed on Central Avenue, just a few blocks from the Imagine Museum. And its not just exhibitions, glass museums and displays. St. Pete’s glass artists are incredibly active as well. The Warehouse Arts District is home to a plethora of local working artists, as well as visiting artists from across the country. Chihuly, his colleagues and proteges helped the studio glass movement catch fire in the Pacific Northwest and throughout the country. Now, St. Pete’s scene is stealing the spotlight. “Part of it [studio glass] had a prominence to the Pacific Northwest, which is the whole Seattle scene, and it’s still alive. But here it’s on fire,” says Sikes. “Everyone that I work with in Seattle is here blowing glass at the various facilities.” Those facilities include Warehouse Arts District staples like Duncan McClellen Art Gallery, Zen Glass Studios, Morean Arts Center, and many more small studios. 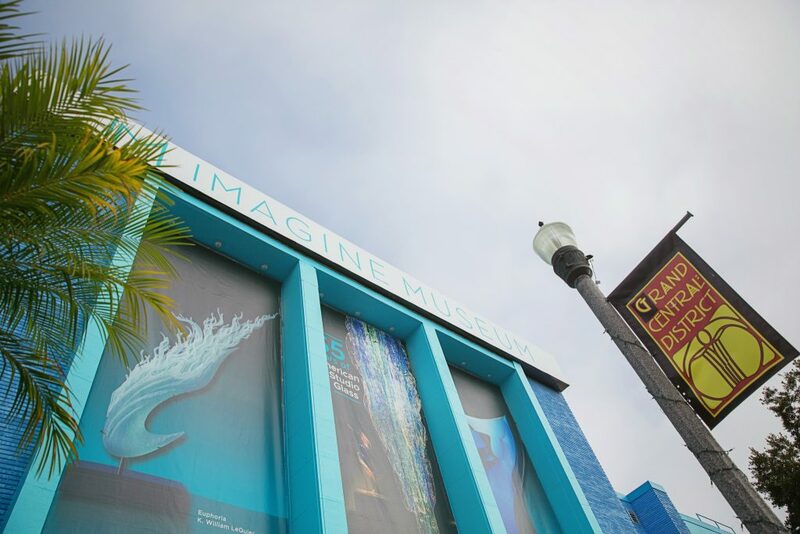 The Imagine Museum provides a jumping off point – a venue to “uplift, inspire and educate” visitors about this uniquely American art form. With appreciation and education – one hopes – come dollars and cents in the pockets of working artists. 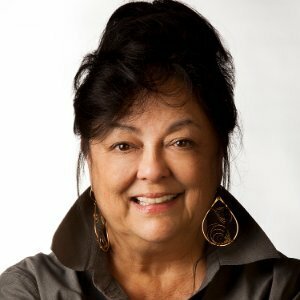 Joe: We are happy to be joined by Joanna Sikes, the Executive Director of the new Imagine Museum in St. Petersburg, Florida. Welcome! Joanna: Oh, I’m glad to be here. Thank you. Joe: So literally in just walking up the stairs to the studio we covered about four things that I can’t wait to talk about. And I’m gonna get straight to the fun one, which is you sing. Joanna: I’m a backup singer and I kind of started in the ‘60s in San Francisco. I went to college when I was 16 under protest. All I wanted to do was to continue playing polo and so I made a deal with my parents if they could find a place where I could take the horses on the West Coast I’d go to College, and unbeknownst to me they found some place that was not Kentucky. And so I ended up at Davis, University of California, which at the time ended up being the best arts school in the country. So that was pure serendipity. But in the meantime on the weekends I sang. And so I came to the Chihuly Studio, which is where I started really working independently for an artist. And I’ve had those two sings, I was a singer but then I also went to arts school. And Dale Chihuly is one of the fathers of the American Studio Glass Movement and the big joke was that he didn’t hire me because for my art degree, he hired me because I could sing. Ashley: So Santana shaped you. Joanna: Yeah, just… I did some work with him; the last CD was three years ago. So basically, he finds someone in the country that he is trying to build their career and then usually the guitarist – Steely Dan, the keyboard singers, all of that, it’s all Santana. And so he puts a group of us from five different bands that really were quite prominent in the ‘60s. Ashley: What other musical artists were you drawn to? Joanna: Well, basically Santana. I think a lot of it – in the ‘60s, of course, I was only 17, but it was Janice Joplin and Grace Slick and all of that, all the women that had really good strong voices, that I still am very partial to singers. Ashley: Is that how you would describe your voice when you sing? Joe: Where did the polo track, then? How long were you able to do that? Joanna: Well, I started jumping horses when I was six, and then halfway through that I was showing horses for a long time. And then, I don’t know, it became I guess more mature and I tried to be practical and decided to stay on the ground and started playing polo only to find out that actually it’s the most vicious of them all. Because there are not a lot of female polo players in various parts of the country, especially not in the Pacific Northwest, which is where I live. I live in Seattle and commute to St. Pete. And so we have to play with men. And it’s soccer, so you’ve forwards and everything, you have the same rules except you’re looking and the guy that you’re guarding or who’s guarding you is six foot two and he weighs 220 pounds. And so as far as trying to be successful in that arena you just go as fast as you can, because we can outrun them usually. Ashley: We talk about our regional footprint here with Tampa, St. Pete and some of the commuting that some have to do. We don’t typically talk about commutes that happen across the country from Seattle. So maybe you shed some light onto that specific arrangement. Joanna: Well, I think it’s amazing to me and it’s wonderful that St. Pete is now recognized as the gold coast and this whole area that we’re in. And St. Pete not only does it have this wonderful cultural vibe, this aliveness about it, but also you have all these amazing museums that are all opening within a very short time period. And for a city of this size to have this caliber of cultural institutions, especially at this point, it’s building up within the arts – it’s astounding! And so the opportunity to come here and to have a chance to work with a team building a glass museum is a chance in a lifetime. This is the fourth museum that I’ve built, but this one in this area it’s like the whole – parts of the glass movement – not all of it by a long shot – but a part of it had a prominence to the Pacific Northwest, which is the whole Seattle scene, and it’s still alive. But here it’s on fire. And it’s so embraced by this community and all of the artists are here and everyone that I work with in Seattle is here blowing glass at the various facilities. And then you have this museum that has a founder who actually buys one of the most important glass collections that was curated for her by the Habatat Gallery, by Corey Hampson. When you build a museum you’re lucky if you can get a collection sometime within that third year of operation. But this museum got to start with a collection. And so it immediately can do its mission, it can immediately inspire and uplift people and educate. And so once again, that’s a great opportunity, but the city of St. Pete is amazing to me because it’s so… I don’t know, it’s active, it’s alive, it seems to be embracing things, it has opportunities for people. And then what I see of course in my business is all of the art. Ashley: And were those the concepts in your other three museums or four museums? Joe: Why glass? How did it start and why the appreciation continued throughout your lifetime? Joanna: Basically I started out as a museum curator and I was a director and fine arts museums and so forth. But I really wanted to have a part to play in the arts. So pretty early on I decided that I just didn’t want to work necessarily for museums, I wanted to work for artists because I wanted to get close to that process. And I missed the abstract expressionists, I wasn’t old enough. And then I was starting to figure out what’s going on and all of a sudden in the Pacific Northwest – I’m in San Francisco, but I’m leaving a museum and I’m a curator and I do sculpture. And every time you leave in a museum you look for some kind of a swan song, some kind of a statement. And this unusual person calls me from Bellevue, Washington. Now I’m in San Francisco, we’re in the ‘80s and as far as I am concerned he’s calling from Alaska. And he tells me that he’s a glass artist, and I’m thinking, ‘A glass artist?’ ‘No, I don’t do decorative, I’m not… I’m sculptors.’ And I give him his first show in California, but at the same time he explains to me what the Americans are doing in their studios, what’s the beginning of the American Studio Glass Movement that started in the ‘70s. So this is like maybe eighty-something. And I start looking at this work and all of the sudden I realize that what the Americans are doing with this material – they’re not inventing the material, the material starts in Roman time, but they’re using it in a way that turns it into sculptural objects. The Americans were led by Dale Chihuly and then others artist too, I’m not just saying him. But one of the things he did, he established a glass blowing school, or an art school with glass, not just blowing, in Seattle in 1972. And what they decided to do, the Americans, after they had developed – Harvey Littleton had developed a furnace which was small enough to fit inside a studio. So that’s the Studio Glass Movement, right? So they could actually work there. Before that didn’t exist in the ‘70s, like ’72 I think is when it happened. So all of a sudden, I realize there’s an art movement here, or something that could turn into something very distinctive, very American – just the way they were using the material. And so I was really fortunate to get hired by Dale Chihuly to basically manage his studio and build his career, and I did that for 30 years. And we thought that it would take 50 and actually before the prominence came, but all these incredible artists, William Morris, all of the people working, all of the artists represented in the museum. It became something really unique and really exciting, and so for me that was what brought me to the material, it’s the way that they were using it. Joe: What else do you have in your personal collection besides glass? Can you give us…? Joe: Cars? Cars and glass, alright. Ashley: Nice. I like this. Joe: What kind of cars? Ashley: Wow! My respect level just went up… a ton. That’s pretty remarkable. Is that what’s involved in your other museum concepts? Joanna: No. It just so happens that another perk, if you would call it that, Chihuly taught me about his business was I was able to buy his cars. And so that started it, but I was always driving something that was too fast when I was in high school and it just stays with me. Ashley: Is this your business? Has this been your life’s work or is there other sources of income for you over the course of your life? Joanna: No, life’s work. I think… I started freelancing and just concentrating on building museums I guess it’s within the last seven years. I was trying to figure out – I wanted to stop having to do something. When you decide you’re gonna be a consultant you think you’re gonna have all that free time and then of course you work twice as hard and twice as much as you did before. So I’m sort of in that. But for me, I’m hired by a museum if one, they’re building a facility and then I stay with it and help it grow and get it to where it’s really functioning. And that’s everything from staff to architecture to by-laws to registrations, all of that stuff. Or you’re in distress, perhaps you have not been managing your funds – should we say that? – appropriately. Joanna: And so you need someone to come in and turn the business aspect of it around. Because I do, obviously, love the creativity, but I also like the business of a museum. Ashley: Can you talk about that a little bit? How long did it take for your concept to come to fruition, to build and to create the team? Joanna: Well, this museum of course has a phenomenal founder, Trish Duggan, and it’s really through her patronage that this museum has been able to be built. And then there are an incredible staff on the museum, we have wonderful people in the day to day parts of the museum and also, of course, deals with the creativity for the future is lead by our deputy director who is Jane Buckman. And without the team we couldn’t have anything. But Trish gave us a fairly accelerated plan for opening the museum. We had a building, but it had to be redone. So you’re something like, I don’t know, three to six or seven years and we did it in 17 months. Joanna: But it’s because we have this freedom, because she is an artist and also a philanthropist and very creative. Joe: I’m somewhat not sure. You’re playing polo, driving fast cars in the ‘70s as a woman. I feel like you operate probably above the gender gap to some extent. But when you look at, assuming we have some younger women that are starting their professional careers listening to this, I’d love to hear you talk about your mindset when you were doing things that statistically weren’t common for women to do at that time. Joanna: I think that – for me, and I’m not gonna say that this is for everyone because we all have our different demons or we have those things that either propel us to be successful or hold us back and I’ve had plenty of them at different times… but I’ve always felt, especially when I started the whole glass blowing thing – and even in museums it was really all about the boys. If you were in a museum and you were a curator, you had made it pretty much to the top of the pile. And whereas now I think it’s something like 65% of the museums in the United States are directed by women. But at the time it just never seemed to me that – not that it didn’t hold me back, I could be really aware if I was excluded from a meeting, or sort of sat to the left, so to speak. But I always felt that it’s not about trying to be a boy. It’s about being a girl. If we negotiate differently, we manage differently, we think differently, we have different things where we get our power from. And so just remember that. It sounds simple, but I didn’t feel that I was competing with any of the men that I worked with. I felt that I was equal because I was always myself. Joe: That’s a great answer, I wasn’t sure exactly how to ask that question, but that answer made it worth it, thank you. That was great. So the other thing I’m curious about is you’ve had a very great life and the mix in what we’ve learned about in the few minutes we’ve been together has been impressive. So can you tie a common thread of philosophy to how you went about, or what you looked for and how you chose to spend your time over the years? Joanna: Don’t be afraid of failing and accept the fact that you fail. Just don’t be scared of it. Try and get out in front of yourself. And that’s not to say that I’m in a situation where, say, I need to ask someone to leave the company. And I know it’s probably the most personal thing I can ever do to somebody no matter what the circumstances. I can do what I need to do and do it in a fair way, do it in a way that the person is still my friend, but that doesn’t mean that I don’t cry right before I go in or I don’t have that nervous thing or I don’t cry as I walk out, but I allow myself to be that way. That’s who I am, if I am emotional about something I go there. If I’m not, I don’t. I don’t know if that necessarily answers your question, but I just always operate in the present. Joe: It sounds like there is a lovely efficiency to that because instead of having a meta-level of emotion thinking about your emotion, you just experience your emotion and that sounds very free. Joanna: You get so many riches back if you’re doing that. Ashley: I feel like I had an identical conversation yesterday actually. It’s sort of in some cases you have to pick between popularity and agency/command over a specific role or expectation for a role. And it can be something to toggle for sure. I’m wondering if you think that there’s a certain amount of leniency around the expression of emotion for artists, sort of there’s a permeable boundary between both sides of our brains that give us the rails and the permission to be maybe more emotive. Joanna: I think so because… I think in any kind of a cultural organization where basically everybody is a creative, alright – so that part of the brain is going overtime. Ashley: So how do you organize that? Joanna: I think just allowing them to reach the goal, like say, if there’s something we have to accomplish, alright? So we need to do this. So I have a way that I would like you to proceed to be successful. Ashley: And what if I were to say, ‘But I feel like we need to go in this direction’? Joanna: Then all you have to do is tell me if you can get to the same goal by operating off your feelings, that’s fine. You can always check back. Because I’m asking you to behave the way or to perform in a way or to get your task done the way I would approach it. But since I am a creative I know that that’s just unique to me. It’s not unique to you. Joe: You mentioned on the way up here a project that you’re working on with Mr. Paul Allen. I’m curious as to what that is. Joanna: I just finished a nine-month contract with him and basically, I’ve been really lucky because Dale Chihuly and these other people and of course, Paul Allen comes into that, are genius level, right? And so the way they see things and the way they tackle things – and then they have the wherewithal to make this thing come true. This is the same with our founder, with Trish Duggan. So what he decided to do is on the coast of Washington, let’s see, it’s from Sausalito to Oregon and right up to Alaska, it’s the only area on the coast and the entire continent that doesn’t have any marine or wildlife rescue. And yet we have the orca whale, we have all of these populations there. So he decided to remedy that and so he started a company called SR3. And so for me getting involved, but first of all I’ve worked with him before on different projects, but this one was about really saving something and had a real visual way to be successful and that’s saving the mammals. And so it was a start-up and so where I come in is always on the start-up, and then once it’s up and running… then I’m on to something else. Joanna: But it’s the same genius. Joanna: It’s the same – you have a problem and there’s no way you can fail unless you stop, and you just go forward. I was pre-med at one point and I only wanted to be an emergency room doctor. I wanted as much pathology as fast as it could come so that every day was different. And I also knew that I could not be a family doctor where I personally knew the people and I lost them. So I could do it in an emergency situation but not if I had helped to raise them or something. Joe: So it makes me curious about your relationship with time. I know that I’m – at the arc that I’m in in my career I have a similar want to just be at the edge of my productivity level, pushing, running almost on adrenaline on a daily basis. And I feel when I do, if I’m ready to collapse at the end of the day then it was a good day. As you progress through your life has your relationship with time changed in that respect? Joanna: No, I collapse at the end of the day. Joe: So I can look forward to doing that till the end? Joe: Then as you get more success in your life actually that just gives you more opportunity, and not only more opportunity but the opportunity to do exactly what you want to do and get somebody else to do the rest, right? Yeah. Joe: Best place to be. Ashley: So, bringing it to present day, at the Imagine Museum when you consider the dependency of contributed revenue to support your operations in the form of donations – and a lot of donors, at least locally… crave that connection to the visionary behind the mission. Talk to us about how you’ve navigated donor relations here. Joanna: Well, we’ve just started because we’ve only been up for, what is it? – two months now. Well basically it’s like it’s always the same in that it’s personal. Raising money is personal. You give to a program or you give to something that delivers, right? – to a community or to a particular audience. So it’s like say if you’re out asking… for every dollar that comes in the museum gives it back. It’s a pass through. And so the nice thing about it is that it’s – we’re just starting to look for sponsorship and stuff, but we have a very defined mission and that is that we are talking about and we’re showing the American Studio Glass Movement. And our founder is adamant and rightly so that we uplift, inspire and educate. And we keep that in our head all the time and that’s why it’s called Imagine. So it’s all about taking this collection and then reaching out in the community and turning it around and giving it as a gift. Ashley: And I don’t want to assume this is the first time you’ve heard this question, but how does the experience at Imagine differ from the experience at Chihuly? Joanna: Well I think basically, for Dale, because of his prominence a lot of people have seen glass art through his eyes, either through the PBS programs that we fund or all the stuff where… It was interesting, I think about in our tenth year when it looked like the studio was going to be successful and we went into an elevator and he said, ‘Well, do you think I’m famous now?’ And I said, ‘I think so.’ And he goes, ‘Okay, start giving the money away.’ So from then on large of the profits were kicked back out, kicked back out. And so that’s a one-man vision and you’ve got one visual art form and you’re showing people about it all the time though. He was constantly teaching, constantly giving away, constantly bringing people in the studio, sharing how he works. And then you come to the Imagine and say you have a sort of peripheral idea of Dale or glass… Or maybe you know more about it and you walk into the Imagine and here are all these artists who you are not personally aware of unless you’re intricately involved in the movement. And they’re all working in glass in ways that has nothing to do with Chihuly. And all of a sudden you see, ‘Oh my God, there are all of these people, this really is an art movement.’ And they are working on the side of him or whatever, they’ve gone off, they’ve done their own thing, they are extremely prolific and stand alone without him. And so it’s nice, you – not to do a pun – a punch through the glass ceiling, but when you get to come to the Imagine and really see all of this as opposed to a single exhibition by one of these artists, then the impact of who they are and what they’ve been doing and the strides they made are really visible. Ashley: So if you think about the collection and we’ll call them your babies currently, and if you could describe for our listeners maybe one of your favorite babies and why it speaks to you so much, one piece? Joanna: Oh boy, that’s hard. Because each one of them is so strong, that’s what you see, their voices are so strong. Ashley: If you could select one just randomly, what it is you would extract from that observation and that engagement with it? Joanna: Okay, I think I’ll do… Brent Kee Young. There’s a way of working with glass because it’s not all glass blowing – they slump, they mold, they lamp work, they just all – and that’s the other thing, you see all the techniques. And so lampworking is where you have a torch and you have your glass rod and you heat it up and – We have seen all the little horses in the merry-go-round thing with the carnivals and stuff and how sweet they are. Well, this is a man who works that way but he’s also a mathematician, and so his pieces are full size chairs or huge cubes that are say, four feet in diameter, with a circle blown on the inside. So he defies the fact that the material has this very sort of fragile aspect, but he makes these huge installations out of it. And just that, being that precise and then working with glass’ chemistry, it’s physics… and it’s chemistry for the make-up of the material, but it’s also physics. And so he defies the fact that lampworkers who make that little thing, he makes something that it’s so big it’s a tunnel, and we have a tunnel that almost spans the width of a room. Joe: Is there anything in the last two or so years that has jumped out at you that if you would say if there was a… well, not that you wouldn’t do it yourself, but just something that if you are at that place to really get involved with something early and ride it for the next 20-30 years that you would suggest that people look into? Joanna: I don’t know because I’m not… I never even thought that I would be him for 30 years. The longevity aspect of it was because you’re seeing something that’s going from birth to being basically within the art world, something that’s very accepted as a fine art form. And now I’m much more interested in short term projects so I’m not projecting like that. I have an opportunity, I can only just so say because we’re not supposed to, but to write a sitcom. And I think I’m gonna try that. Joanna: M-hm. About the art world. Ashley: Interesting. A dark comedy? Ashley: Is there a station you could give us to give us the idea of genre…? Joe: Or what the format, is it…? Joe: Your sense of humor has been… you’ve cracked a few jokes since you’ve been here. You’ve been very wry. Ashley: And no canned laughter. I can’t imagine canned laughter when this comes out. Joe: No canned, yeah. Real laughter. Joanna: But then a lot of other artists and stuff are coming on the writing team. Ashley: …after you sit through a play or you sit through a song performance you can’t hold on, there’s nothing tangible anymore. And how he believes, or there are perceptions that more static art, more fixed presence of art is still valued in a different way. What do you…? Joanna: It is, it is still valued in a different way. And I just think I always wanted to be a writer. You write a lot when you’re a museum curator, you have to write about art. But this will be fun. Joanna: There’s a dollar value… With the painting by Basquiat that’s traveling around now, and what is that? Seventeen point something million? Joanna: It’s touring the country now and it’s considered an exhibition all by itself. And that… the masters and all that was always that, but to take a big contemporary piece it’s pretty interesting. And so it has a traveling schedule, you have to pay 25 dollars to look at it and in fact it’s going into the Seattle art museum for three months, it will have a run just like a show. Ashley: Are you a Rodin fan? Ashley: I would think with your sculpting background that probably appealed to you. Joanna: Yeah. I like a lot of the big contemporary people, Richard Serra, Donald Lipski, all of that who made great big dirt walls and things like that. And that was when Dale convinced me, or I convinced myself or – I consider myself very lucky to have had the chance to work with him. He wanted to be a sculptor, he wanted to get up off the table and he did [laughing]… very successfully. Coming to the museum, I think is really important, because it does give the visitor an incredible view into exactly what the glass world is all about and the way the Americans changed it. Until… they started working – you can never say anything all-exclusive because you would have to look at every person who ever touched glass. But basically it is the conception and the belief that one of the things the Americans did is they didn’t use molds. In other words, they let the glass lead. So when they blew glass, or they did something it slumped, and they did things. And that was not really the way to work until then, they could take a gamble that this would be an acceptable way to do it. Ashley: My user experience is that even with static art it’s different every single time that I’ve returned to a specific piece so I’ve never experienced art as something fixed or tangible even if it doesn’t move. Joanna: Even if it doesn’t move because that’s true. Because so much of when you look at a piece of art has to do with you. Joanna: Right, it’s how you feel, if you had a good day, if you had a bad day. Ashley: You hate cubes, you hate large tunnels in the middle of rooms. Joanna: Right. But then a few years go by and you go, ‘Wow, actually I kind of like that. Which it goes for food, it goes for so many things, it just happens to be how you interpret it at the time. Joe: I think there’s a nuts and bolts aspect to it because of stored value, right? A painting is an object that can hold value, that you can pass between one person and another. And an experience is not something that you can hold and pass between – it’s exclusive to you and your brain and so therefore there is no way to attribute… there’s no investment you can make in that, there’s not way to transfer that value… financially. Ashley: I also think just specifically about glass and I don’t know if you’ve heard this from other individuals, but I have an appreciation for the actual mold, the color, but it allows me to engage with illumination very differently and lighting very differently in a way that other art forms don’t. Joanna: Well, the founders of the… Studio Glass Movement, they just about all including Chihuly were – well, they were called hot which means that they were working in ceramics which are opaque. And they left the ceramics because they wanted something translucent and so they went to the glass. So in talking about Dale, yes, he is a glass artist – but he likes to be known as an artist who works in… so how did we say it? We could say he is… he works in glass and ice and water and what was the third one? It wasn’t Jell-O, it was glass, ice, water… I think that was it. So he works in all those materials and what all those materials have is they’re translucent. Light, sorry. There it is. And so we did crazy things like took over a whole ice rink in Tacoma and went to an ice house where they still make great big blocks of ice like you used to put in your refrigerator or whatever. And he works in neon, that’s the other one. And so he gassed up all these tubes and we put them in the ice cubes and then put – it was 30 tons of ice, different colors and… ice rink and then watched it melt. We went to Jerusalem, we built an ice wall that was… we used eight-ton blocks, so it must’ve been 30 feet long and about 20 feet high and we built it overnight next to the Jaffa Gate in Jerusalem, we flew it into Tel Aviv so that when the population of Jerusalem woke up there was an ice wall there. Joanna: And a lot of them had never seen ice [laughing]. Ashley: This could be the best podcast – SPX episode you listened to date. I need to find a different word. Joe: Yeah, a lot of wows. Which is good. We had Alex Harris on yesterday and he’s running a thing called ACT. And one of the things we talked about with him as he came up through his career, and I think a lot of… anybody that’s been in an undefined field of work – how to craft those engagements. So, this is a tactical business question for you. The things that you’re doing are all over the place in a great way, so what is your advice for people to – when you talk to Paul Allen and he has this idea, how do you craft that engagement, how do you know how much you should receive as a fee and what the goals are? And what’s the process that you go through when you work in these unique individual creative endeavors to – when you’re gonna start a museum for someone, how do you craft those engagements? Ashley: Or even a sitcom. Joe: Or a sitcom, yeah. Joanna: First is it something that I’m really strongly interested in, it’s something I can learn from, it’s something that I can be totally engaged in so that I can be successful? The successful question is not the first one to ask, actually it’s about the fourth one on the list. And what about this that engages me in a different way? So that’s why if someone, no matter what the project is, if they come to me I don’t care how fantastic it is, I don’t care if it has a strong probability of being very difficult, but that usually means I have a lot to learn from it and then hopefully a lot to give for it. Then at the end you can decide okay, I think this is gonna be successful. And it’s the love of the project or how much I know that I’m gonna put into it that determines what the fee would be. But sometimes the fee isn’t that high because I’d give anything just to work on that project. So, I had a friend who – I was at a party and she – this was just two weeks ago, and I don’t know, she was introducing me to somebody. And it was a little bit about a couple of people in the room knew me from doing different things, right? Not necessarily… they all have a common thread. And she goes, ‘Oh, Joanna has a life like Forrest Gump.’ I don’t quite think it’s like that. But it does have that kind of variety to it. They don’t necessarily hook together except that every one of them is creative and… is an opportunity. Ashley: And in the age when personal professional branding is such a buzz word, that’s a bit of an anomaly, right? And maybe that’s inadvertently become your brand. Ashley: Yeah. Run, Forrest, run. Joe: …to find engagements for that. And that’s very special. Ashley: It complements that same guest that you referred to from ACT, and he’s an artist, he grew up a singer, a performer. And when questioned about what specific art form he is currently drawn to, he spoke to the interdependence and interplay, you do one and you transfer some of that into something else, and then you transfer – and he said it’s so interconnected, it’s not one lane, it’s not siloed in any respect. And so, at face value some of your work may not match up, in many cases there are underlying threads that very much do. Joanna: So, it always has a creative platform. Joanna: …or Jell-O. Yeah. It needs a creative solution. Joanna: Yeah. And also… I come from a family of scientists so the interesting thing for me is that all of these projects have an experimental aspect to them. It has an incubator kind of aspect, we have these different avenues and we just keep trying to find which one is the most successful. And so, working for Chihuly I’ve got to meet every scientist I ever wanted to meet in my life, because they understood not just the chemistry and the physics of what’s going on, but it’s totally experimentation and you get immediate gratification or not when you’re working with a fluid material. Right? And that’s red hot. And so, they would spend lots of times with us in the studio and then we got to get to know them. Ashley: What other art forms infuse science in that same way? Joanna: Sculpture has got the dynamics of it. I have an architecture degree too, so you’ve got all that tensile strength and the balance and how you build something. And once again, those kinds of principles start to play out no matter what you’re building. It’s a construct or it’s not… but then you’re building a path, right? And so, there are limits that you can acknowledge because the strength of what you’re thinking, how deep you know what your resources are, what your history is, where your curiosity takes you – those can have limitations. So it’s all sort of the same. Joe: I’m just really impressed with the variety that you’ve had and success at all those different things. And for the record, I don’t think I’ve ever told a guest that I’m impressed before, you are the first. Joe: So because of that I’d like to extract a little more wisdom from you. Joe: Assuming we have some folks, I know we do, that are in their 20s starting out in their career, what are some important things they should be paying attention to, certain things they should read, study, think about, meditate on? Just to drop some wisdom on us. Joanna: I think that intelligence or whatever people use as a marker or a… I don’t know… a tool… We all have a certain amount of grey matter, of stuff that we come to, but the main thing is don’t set limitations. You can find a way to do just about anything you want to. That may be your level of success, but you will feel that level of success. So you’re not Stephen Hawking, but you certainly can be like me, have an opportunity to meet and talk to somebody like that. Be ready to have real conversations with people, you’ll be very surprised. Listen, listen a lot and especially at the beginning. Don’t get in your way, don’t set things that make you think that you can’t have a conversation with anybody you want to. You can. Yeah, you have a different level of, ‘What am I gonna say to Stephen hawking? Nice, big hole.’ And he was really difficult. But the one thing that I learned from Chihuly too, he taught me a lot, was no question is inappropriate if you’re trying to find out. And so the conversation with him – now, I have no big science background. I come from scien—I am not a scientist, I am not a mathematician, yet I found the things that he did, I was very curious about him, so pay attention to what’s going on in the world. So the first thing, the question was, was Einstein all that he was cracked up to be? Yeah, because that’s the level at which I could approach someone like that. We had a great conversation. Listen, take a chance and don’t worry about limiting yourself. Joanna: And I think I got really scared about it, but I also forced myself to do it. Sometimes I know that I didn’t come off as the most brilliant person they ever talked to, but I am honestly curious. Ashley: Maybe not related, but I am curious – what are you working on personally right now in your professional life to improve or develop within yourself? Ashley: Where do those questions come from? Where is that coming from? Joanna: Just like anybody else would do. I’d bought a new car and my son has it this week and I’m thinking, ‘Oh my god, I hope that when I get it back it looks like it does now.’ I gave him a huge – I just bought it before I left, and I said, ‘It drives like a Porsche, remember what it is. Please don’t kill yourself.’ And then he realized that for the entire week I have not had one text from him, ‘How are you doing?’ ‘Oh my God, how is the car?’ So same stuff. Exactly the same stuff. Joe: Wonderful. Yeah, so we very much appreciated your time. Joe: It’s been very illuminating and inspiring. And at the end of each show we do a shout-out to someone that you feel is doing good work that potentially doesn’t get as much attention as they should, just a chance to give them some of that attention. Joanna: Yeah. The deputy director of the Imagine Museum, Jane Buckman. Joe: Who is sitting right behind you – full disclosure. Joanna: But I mean it. Ashley: She’s doing a fist bump right behind you. Ashley: What’s your favorite thing about her? Joanna: The fact that she approaches a challenge knowing that she can do it and she can be in the weeds of this organization with all of these new people, with all of these new challenges and she can do it. That takes an incredible talent and strength and I think that’s something that as women, when you had asked me that question, sometimes we forget we are outrageously strong. Ashley: Well here’s to Jane and here’s to Joanna and here’s to the Imagine Museum. Thank you so much for joining us. Joe Hamilton is the CEO of Big Sea, publisher of the St. Pete Catalyst and a founding Insight Board member at the St. Petersburg Group. Joe brings a strong acumen for strategy and positioning businesses. He serves on several local boards, including TEDx Tampa Bay, which grew his desire to build a platform where the area’s thought leaders could share their valuable insight with the community at large.